The International Livestock Research Institute (ILRI) led Index-based Livestock Insurance (IBLI) project in northern Kenya, which provides livestock insurance to over 2000 households in Marsabit district to help livestock herders sustain their livestock-dependent livelihoods during drought, has received a best-practice award from the Poverty Reduction, Equity and Growth Network in recognition of the project’s innovative approach of combining scientific research and practice. 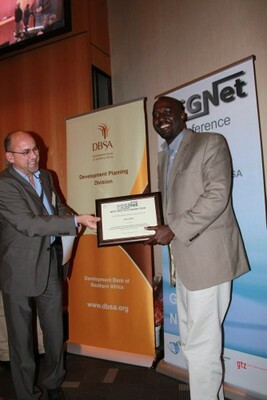 The award was presented to Andrew Mude, an economist with ILRI, who also heads the Index-based Livestock Insurance project, during the Poverty Reduction, Equity and Growth Network’s conference ‘Policies to Foster and Sustain Equitable Development in Times of Crises’ held in Midrand, South Africa, on 2-3 September 2010. Over the past two years, ILRI in collaboration with partners from Cornell University, the BASIS I4 project at the University of California – Davis, and Syracuse University, have come up with a research program that has designed and developed the insurance program. It is now being implemented by commercial partners as a market-led index-based insurance product that is protecting livestock keepers from drought-related animal losses particularly in the drought-prone arid and semi arid areas of Kenya. The program uses satellite imagery to determine and predict potential losses of livestock forage and issue insurance payouts to participating members when incidences of drought occur. The first pilot product of this project, launched in January 2010 in Marsabit, brings together Equity Bank of Kenya, UAP Insurance and Swiss-Re as commercial partners who are running a commercially viable insurance product. This is a first-of-its-kind initiative in Africa and it holds enormous potential for benefitting livestock keepers in the region and across the continent. So far, the project has recorded over 2000 contracts covering livestock worth over US$1 million and attracting premiums of over US$77,000. The project is expected to bring economic and social benefits to livestock keepers and protect households against drought-induced livestock losses thereby reducing their likelihood of descending into poverty. 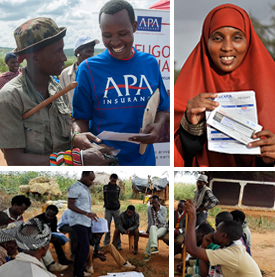 By insuring the assets of pastoralists against catastrophic losses, members will be able to come out of poverty, be protected from the risk of falling into poverty and at the same time will have opportunity to explore other activities for household economic development. The impact of the project is currently under assessment to find out its benefits before it can be scaled up to other districts in the country. The Poverty Reduction, Equity and Growth Network brings together researchers with an interest in issues revolving around poverty, inequality and growth in developing countries and links them to German development policy bodies with the aim of among others, using research results for policy advice on pro-poor growth strategies.